Captain America #610 wraps up another story which explores not only Bucky's issues with taking over the role of an icon, his friend Steve Rogers former mantel of Captain America; but Ed Brubaker's latest Cap adventure also explores what a classic Captain America villain such as Baron Zemo thinks of the new Captain America. A few things stand out after finishing the comic of the day. First of all, even though I liked the latest run, a large part of the last bunch of issues has dealt with Bucky being able to accept that he is Captain America. By this point I get. He feels like he can't possibly live up to Steve's legacy...we all get it. 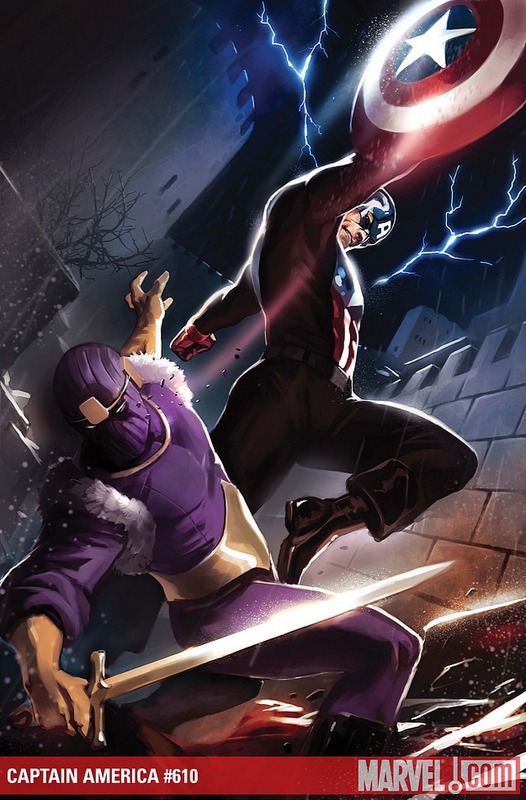 I would like to see a story that has Captain America on a mission that has nothing to do with his past. Though his clouded Winter Soldier past is interesting, a new creation by Brubaker may be quite refreshing. The second thing I noticed about Captain America #610 is that Butch Guice can draw a tone appropriate book. The art isn't amazing but it tells the story with a lot of intensity when the story calls for it. The middle four panels of face, hand, face, eye capture the moment of Captain America's desperate escape from Zemo's rocket. Also, Marko Djurdjevic cover is filled with sweet shield movement and awesomeness.